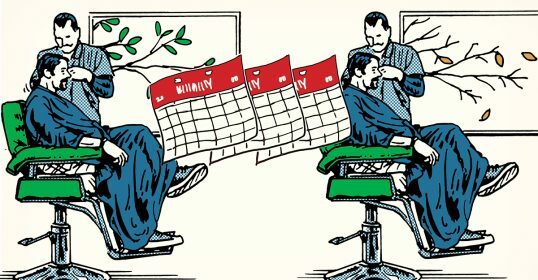 Why should a man care about dry cleaning? When your expensive clothing is damaged or lost, what can you do? I’m sure many of you reading this have been burned when it comes to having a garment come back missing buttons, torn, or in the worst case scenario-doesn’t come back at all. You may have purchased your suit for $2,000, but if it vanishes you’ll be lucky to see 1/10th of that. The key to preventing a loss is up-front preparation – which we’ll discuss below. Dry cleaning your clothing unnecessarily shortens the usable life of your garments. I’ve met men who dry clean their clothing once a week – others twice a year. When should you dry clean and what are the effects of the dry cleaning solvent on your suit’s wool fibers? We’ll get into the details here. You should understand what you are spending your money on. What’s the difference between the dry cleaner next to your house that charges 99 cents per shirt vs. the one near your office that charges triple that? Is the more expensive one worth the money? We’ll discuss ways to measure the quality of a dry cleaner and choose the best one for your needs. Dry cleaning is a cleansing process that uses a solvent called perchlorethylene or DF2000 to clean clothing. The perc (as it’s called in the industry) is run through the garment and then extracted along with dislodged oils, food, dust, and other unwanted dirt particles. Since soap & water are not used in the process, it’s called “dry” cleaning. 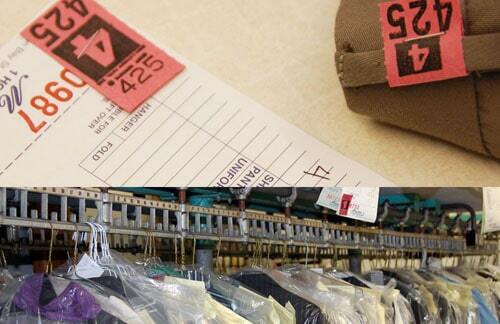 Make sure your garments are properly tagged – this is where most problems start! The dry cleaning process starts when you drop your clothing off; first it’s tagged and then sorted by whether it needs to be dry cleaned, laundered, pressed, or altered. At this point the clothing is often moved to another location; in fact, it’s not uncommon for all the dry cleaners in an area to use the same contractor or be owned by a few companies. This is why many cannot offer same day service or when “they” lose a garment you’re out of luck because the garment is lost in a much larger system than just the facility you dropped it off at. Also, despite two cleaners charging different prices for the same service, if they use the same master cleaning facility, you are receiving no added benefit despite paying more. I always look to use cleaners who do their work in house – I like knowing my garments are kept right where I dropped them off and handled by the person I gave them to. Back to the process – after the drop-off stains are pre-treated (note – it’s very important you point out stains and label what the stain is so that it is treated properly) and the clothing is loaded into large machines where they sit in baskets and rotate in perchlorethylene – the perc is then drained using centrifugal force (shirts and other cotton garments are more often simply laundered with water and soap – it’s less expensive and does the job without damaging the fabric). A good cleaning facility will then inspect clothing for any remaining soiled spots and post-treat if necessary. Next the clothing is lightly steamed, pressed, and ironed where applicable. Finally, garments are sorted out, shipped if necessary, and then stored for pick-up. Always ask: Does your suit or shirt really need to be dry cleaned? Most of us dry clean our delicate clothing way too much; more often than not simply brushing your wool sports jacket and hanging it in a well ventilated area will eliminate odors caused by light smoke or food. If you spill food or drink on the garment, simply spot clean it as necessary by gently blotting the cotton or wool fabric with clean water. Stains that require quick attention such as mustard or red wine, especially on light colored or silk fabrics, should be taken to the cleaners the next morning. Immediate action after the spill should be to change the garment if possible, slip it off in the case of a tie, or carry on as if it doesn’t bother you. Avoid home remedies such as club soda and salt and never rub a stain or put water on a fabric that can’t be washed in water (ties especially) – you’re just as likely to damage the fabric, especially if it’s fragile. How often should a person dry clean their wool clothing? There is no right answer here; an architect who wears a sports jacket to the job site in Orlando is going to soil his jacket much faster than a computer engineer wearing the same jacket in the Bay Area. My guidance here is when brushing, spot cleaning, and airing out no longer do the trick….take the wool garment into a quality cleaner. Dry clean when you must, not on a set schedule that will strip and weaken the wool fibers and damage their ability to crimp, thus unnecessarily aging the garment. The specialized machinery that cleans, steams, and presses your clothing. How should a man select a dry cleaner? Selecting a dry cleaner is very similar to selecting a tailor. What is their lost garment/damage to clothing policy? Do they replace or give you depreciated value as listed in the International Fabricare Institute’s Fair Claims Guide? What this means is that a three year old custom suit bought for 2K can be argued by a cleaner to only be worth 200 dollars. So was saving that $5 worth it? Always choose a cleaner with a great replacement policy. Are they clear on their pricing? Do they try the old “bait and switch” trick, and if so, what does this say about the integrity of the cleaner? Make sure to ask how much you’ll be charged upon picking up your item – the lowest price guarantee that brought you into the store may only apply to one item, and even the listed prices may just be starting prices not including extra costs applied to specialty garments. How long have they been in business under their current name? Be wary of a cleaner that has changed ownership and names every few years. In the case you do have an issue with a cleaner, take them to court, and win, collecting on a judgment is notoriously difficult because unless they voluntarily pay up, you need to force a withdrawal. Dry cleaning businesses can often maintain multiple bank accounts under various names and you may end up filing with a court a half dozen times for a sum that quickly becomes not worth the effort. What level of training do they have? When you hand the person behind the counter a silk shirt and ask for it to be laundered, you want someone behind the counter to suggest that the shirt be carefully dry cleaned instead, since a harsh washing method like laundering would destroy the shirt. Don’t be afraid to ask about trainings and “test” their knowledge of the cleaning process. Are they environmentally friendly? Repeated exposure to large amounts of perc can cause cancer in humans. I am very pleased to see professionals in the industry such as Jerry Pozniak moving to a chemical free cleaning process that involves CO2. In addition to being friendly to the environment, it is a superior cleaner to petrochemicals. Do your homework. Do a Google search and locate any online reviews – what are others saying about how the dry cleaner reacted when something went wrong? Now realize a customer’s view is only one side of the story and an upset customer is more likely to report a problem than a satisfied one is to give praise – so don’t let a single review scare you off. But don’t ignore it either. Give them a call and ask a few questions – are they friendly and competent or rude and unhelpful? Are they on America’s Best Cleaners list? Maintain your records. Ensure that when you drop off your clothing you receive a detailed receipt. It should have a legible description of what you dropped off, when it was dropped off, who it was left with, and what you asked to have done. For most shops this isn’t standard, and may be met with a frown, especially at rush hour. But without it it’s your word vs. theirs if something goes wrong. Also, you should have photographs or video of all your valuable clothing – the great part here is that this can also be used for your home insurance records as well. Foster a relationship of trust. The best way to protect yourself is to create a long term relationship with a merchant that builds trust between both parties. The men and women in the dry cleaning industry are like anyone else, and will often bend over backwards for a customer they like. You have to understand the margins in this industry are paper thin, and many of these companies would go out of business if it wasn’t for family members pitching in. However, they often do realize a long-term relationship isn’t about a single sale and are very interested in building loyalty and repeat business. So strike up a conversation, tip if the service warrants, learn their names and ask about their family – because when you lose that receipt, and they lose the garment, more often than not an agreeable settlement will be reached. A big thank you to Martin and Tanya Martin of Martin’s 1 hour cleaners in Shawano, WI for the images.